Stroke associated with left atrial mass: Association of cerebral aneurysm with left atrial myxoma! Association of LA myxoma with cerebral aneurysm is rare. 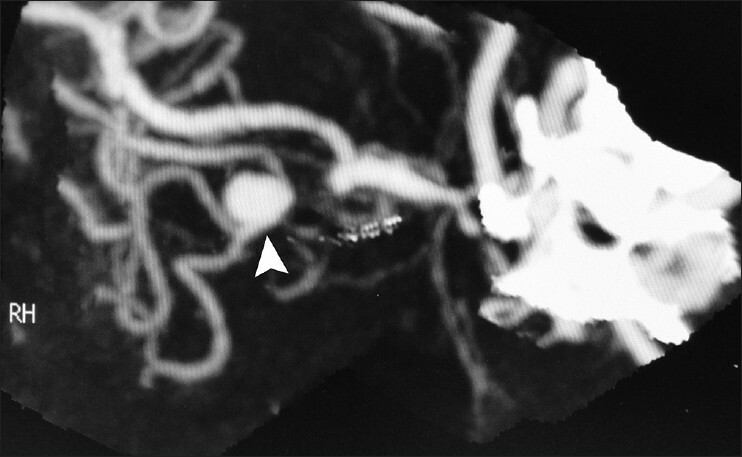 We describe a patient who had LA mass and cerebral aneurysm and developed stroke. The patient underwent clipping of the cerebral aneurysm. We discuss the pathology of the association and the anesthetic management. Benign cardiac masses include myxomas, lipomas, fibromas, papillary fibroelastomas, rhabdomyomas and angiomas. Clinical and morphological characteristics are useful in differentiating them. Atrial myxoma is a pedunculated mass that usually originates from region of fossa ovalis into left atrium though other intracardiac sites may not be spared. These are most commonly reported tumors of heart. Neurologic event in a patient having left atrial (LA) myxoma can be ischemic secondary to tumor embolization or from subarachnoid hemorrhage from concomitantly occurring cerebral aneurysms. Myxomas need to be differentiated from LA thrombus as well. We report neurologic event in a patient having right middle cerebral artery (MCA) aneurysm, LA mass, probably myxoma, and mitral regurgitation (MR). A 30-year-old 52 kg female patient presented with sudden onset of severe right sided headache, weakness of left upper and lower limbs and deviation of angle of mouth to right side with slurring of speech. There was no history of trauma, loss of consciousness or seizures. On examination, pulse rate was 72/min, blood pressure was 130/80 mmHg and a grade 4 systolic murmur was heard in left mid axillary region. Her higher mental functions were normal and the muscle power was 4/5 on left side of the body with right facial palsy. Her laboratory investigations were within normal limits except hemoglobin, which was 7.6 gm%. Magnetic resonance imaging (MRI) brain showed right MCA territory infarct. Computed tomography angiography showed saccular aneurysm arising from M2 segment of right MCA of size 8.3 mm × 5 mm × 5 mm [Figure 1] and [Figure 2]. The electrocardiography (ECG) showed isolated finding of inverted T wave in lead V1-V3. 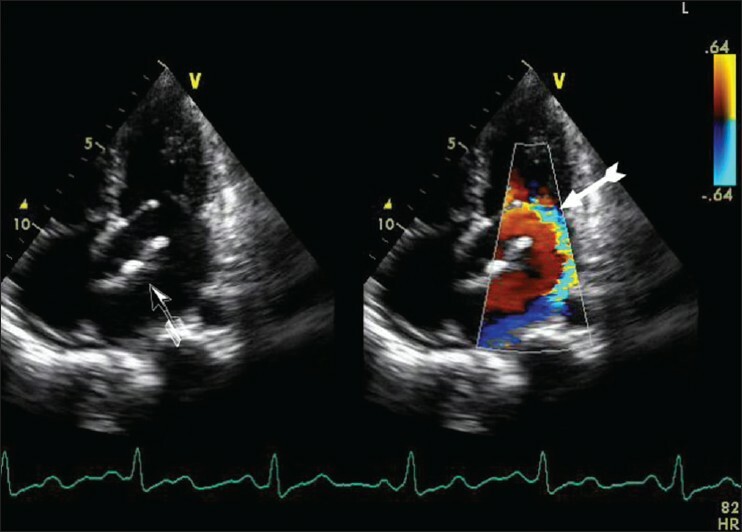 The transthoracic echocardiography revealed moderate to severe MR, mild tricuspid regurgitation, moderate pulmonary hypertension, mildly dilated left ventricle (LV) with normal contractility and a LA mass of 8 mm × 33 mm attached to interatrial septum near fossa ovalis [Figure 3]. The mass seemed to remain in LA throughout the cardiac cycle. It did not straddle the mitral valve. A pre-operative conference included neuro and cardiac anesthesiologists, cardiac surgeon, neurosurgeon, the patient herself and the patient's husband. After discussion, the patient consented only for cerebral aneurysm clipping under general anesthesia. The endovascular coiling of the aneurysm was considered expensive and the patient did not opt for that. Oral lorazepam (2 mg) was given for premedication. In the operating room, venous, arterial and central venous catheter (3 lumen 7.5 Fr Edwards life sciences) was placed under local anesthesia. Patient was induced with etomidate 0.3 mg/kg and fentanyl 4 μg/kg. Pancuronium 0.12 mg/kg was administered to facilitated endotracheal intubation. Anesthesia was maintained with propofol infusion (50-100 μg/kg/min); isoflurane 0.6-0.8% and intermittent boluses of fentanyl 50 μg repeated every 30 min. Monitoring included five lead ECG, pulse oximetry, continuous arterial pressure, central venous pressure (CVP), end tidal CO 2 , core and peripheral temperature and urine output. Patient was positioned supine, with only head slightly up and turned left. Patient was kept warmed during surgery with electrical full body blankets. Fluid infusion during surgery included 1500 ml normal saline and 500 ml tetra starch in balanced salt solution. An episode of mild hypotension and bradycardia occurred after induction that responded to atropine and phenylephrine. Mannitol 50 g was given just before craniotomy to ensure a relaxed brain. After dissection of aneurysm and before application of temporary clips, 750 mg thiopentone was administered over 5 min. Temporary clips were applied for 4-6 min for 3 times. Throughout the procedure mean arterial pressure was kept > 90 mmHg. During surgery urine out was 600 ml. Arterial blood gas was within the normal limits. At the end of surgical procedure, muscle relaxant effect was reversed with neostigmine and glycopyrrolate. After ensuring full consciousness, orientation, full muscle power and ability to follow commands and to move all four limbs, the patient was extubated and oxygenated with 100% oxygen. Post-operatively, the patient was kept on tapered steroid regimen and the patient remained stable. She was discharged after 1 week and was advised early surgery for LA mass. Commonly, LA masses are myxomas and the typical site of attachment of this mass in our patient favored a myxoma. The lack of infiltration and presence of peduncle also characteristically differentiated the mass as myxoma. LA thrombus can also present with a diagnostic query but location of mass was more in favor of myxoma. Moreover, the patient had no predisposing factors for a thrombus including normal LV function, normal LA size and presence of sinus rhythm. Systemic embolization is reported in approximately 30% cases of LA myxoma. Neurologic problems are acute onset due to tumor embolizing in cerebral circulation, which commonly block MCA and its branches leading to ischemic stroke. The association between cerebral aneurysms and cardiac myxoma is rare and only 40 cases have been reported in the literature. The majority of these cerebral aneurysms were associated with LA myxomas (91%). Atrial myxoma has been implicated in the etiopathogenesis of cerebral aneurysms. Stoane et al. postulated that infiltration of intracranial arterial wall with embolized tumor cells leads to destruction of its media with weakening of wall leading to pseudoaneurysm formation. Furuya et al. postulated that direct transendothelial penetration by myxomatous tumor cells in to arterial wall in brain can cause dilatation of lumen by subendothelial growth and had supported their hypothesis with histopathological studies. Alternatively, the myxoma emboli are believed to release vasoactive substances that weaken vessel wall and form aneurysms. These aneurysms are mainly fusiform but can be saccular in shape and often multiple. In the present patient, the occurrence of MCA aneurysm was an association with LA myxoma but the presentation with stroke was not due to aneurysmal bleeding as was shown by cerebral angiography and MRI. This might be due to tumor cell embolizing in the cerebral vessels, but it is difficult to prove. During preliminary discussion before surgery, a possibility of a combined procedure was explored. Only one combined procedure for cerebral aneurysm clipping and coronary artery bypass grafting on cardiopulmonary bypass is described, which was done under deep hypothermic circulatory arrest (DHCA). The patient survived for 4 days and then succumbed to prolonged hypoxia due to pneumothorax, which was unrelated to surgical procedure. The authors did not describe why DHCA was used in the reported case. Our own lack of experience for such combined procedures and the patients consent for the neurosurgical procedure only left us with the option of clipping the aneurysm under general anaesthesia. The general anesthesia was tailored to address the specific needs for simultaneously occurring cerebral aneurysm, moderately severe MR and atrial myxoma. To ensure brain relaxation and to facilitate craniotomy, mannitol was used; here it is important that patients with MR need adequate circulating volume to maintain cardiac output. Therefore, adequate fluids were administered guided by CVP. Pulmonary artery catheter, pulmonary capillary wedge pressure monitoring and transesophageal echocardiography could have guided fluid replenishments in a better way. After permanent clipping of aneurysm, modest hypertension (systolic pressure - 140-150 mmHg) was achieved for the next 10 h by intravenous fluids and a low dose infusion of norepinephrine. The vasoconstrictors should be infused cautiously as the increase in after load in the setting of MR may result in increase in the regurgitant fraction and drop in cardiac output, which can potentially reduce cerebral blood flow and harmful in the setting of cerebral aneurysm surgery. Any hyperdynamicity of the heart due to increase in HR or myocardial contractility could increase MR and may cause breakage of the myxoma leading to embolization. Transesophageal echocardiography would have been a right choice to keep a constant vigil of MR, cardiac output, myxoma and hyperdynamicity and LV end diastolic volumes. 1. Reynen K. Cardiac myxomas. N Engl J Med 1995;333:1610-7. 2. Castillo JG, Silvay G. Characterization and management of cardiac tumors. Semin Cardiothorac Vasc Anesth 2010;14:6-20. 3. Pinede L, Duhaut P, Loire R. Clinical presentation of left atrial cardiac myxoma. A series of 112 consecutive cases. Medicine (Baltimore) 2001;80:159-72. 4. 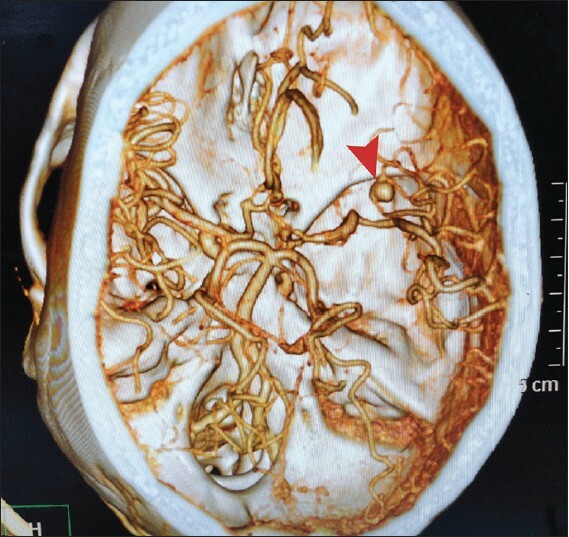 Ivanoviæ BA, Tadiæ M, Vraneš M, Orboviæ B. Cerebral aneurysm associated with cardiac myxoma: Case report. Bosn J Basic Med Sci 2011;11:65-8. 5. Stoane L, Allen JH Jr, Collins HA. Radiologic observations in cerebral embolization from left heart myxomas. Radiology 1966;87:262-6. 6. Furuya K, Sasaki T, Yoshimoto Y, Okada Y, Fujimaki T, Kirino T. Histologically verified cerebral aneurysm formation secondary to embolism from cardiac myxoma. Case report. J Neurosurg 1995;83:170-3. 7. Sabolek M, Bachus-Banaschak K, Bachus R, Arnold G, Storch A. Multiple cerebral aneurysms as delayed complication of left cardiac myxoma: A case report and review. Acta Neurol Scand 2005;111:345-50. 8. Hachwa B, Walker M, Dalton R, Gerhardt M, Bergese SD. Giant cerebral aneurysm clipping in combination with coronary artery bypass graft. Anesth Analg 2007;104:220-1.